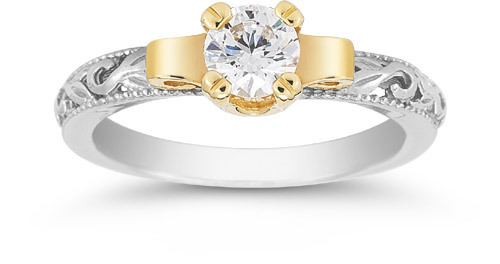 This engagement ring revels in the Art Deco period design. 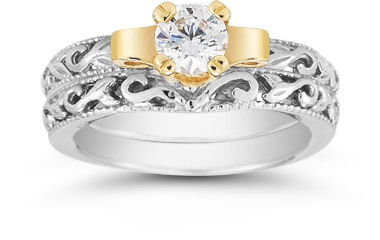 Swirling flower and petal motif is delicately etched in the smooth 14K white gold bands. An intricate, lustrous yellow gold lotus flower opens to offer one solitaire, brilliant cut diamond. 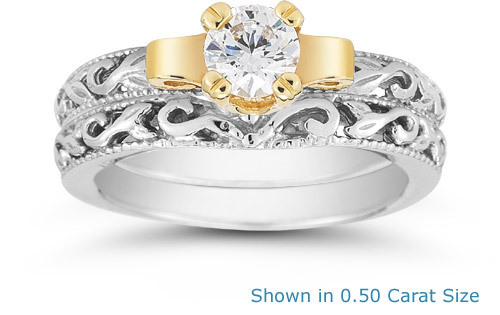 Apples of Gold Jewelry guarantees the Art Deco 1/4 Carat Diamond Bridal Set - 14K Two-Tone Gold to be of high quality and an authentic engagement ring with real diamonds, as described above.